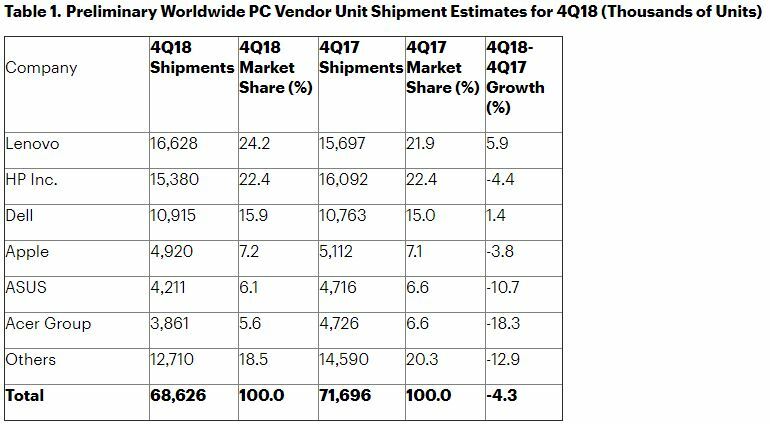 A preliminary report published by Gartner Inc. recently concluded that global PC shipments dropped by 4.3 per cent in Q4 2018. According to the report, 68.8 million PCs were sold in 2018, a 4.3 per cent drop year-over-year. 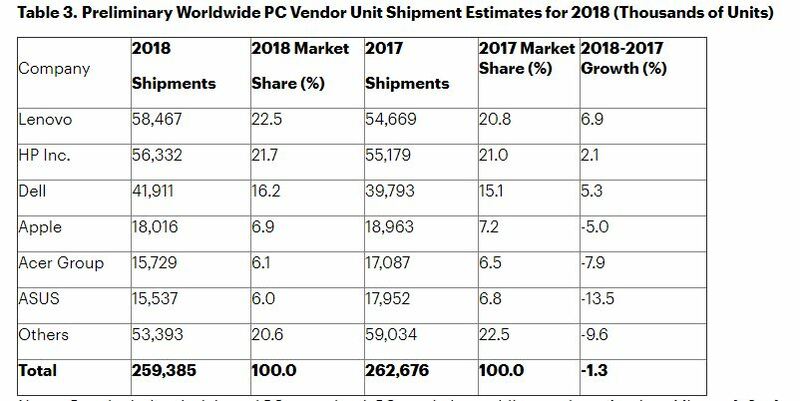 Incidentally, total annual PC shipment was down 1.3 year-over-year, marking the seventh consecutive year of global PC shipment decline – albeit less significant than previous years. In Q4 2018, Lenovo surpassed HP as the number one PC manufacturer. It shipped 16.628 million units world-wide compared to HP’s 15.380 million. Gartner attributes Lenovo’s success to its joint venture with Fujitsu in Nov. 208 when it took over Fujitsu’s personal computer business with DBJ. The report blames processor and graphics shortages as the culprit of the declining sales. In Sept. 2018, Intel addressed its CPU shortage in an open letter, promising that it would still produce enough chips to meet year-end revenue targets. In addition to component shortages, Kitagawa also notes that consumers are purchasing fewer PCs during holiday sales. “Consumer demand remained weak in the holiday season. Holiday sales are no longer a major factor driving consumer demand for PCs.” Kitagawa said in the press release.